The title today is stretching my Italian. I think that’s the correct translation (from English to Italian) but I’m not an expert by any means. In Italy, I would say something in Italian and get a response in English. But at least I tried. Luckily for us, tomatoes are still in season here so we’ve been having a lot of tomato sauces and tomato soups (don’t you wish you lived in Southern California? of course you probably don’t have massive fires where you live so it’s probably a wash). We hadn’t had ravioli in a while and I figured it would be a good match for the tomatoes I bought at the Farmer’s Market. When it comes to ravioli, I usually just make cheese ravioli. Meat ravioli can be good but frequently they tend to be too much flavor in one place. I also don’t particularly care for the texture of chopped meat. Cheese ravioli have a much simpler, cleaner flavor. I tried to keep the ravioli filling simple, partially because I’m lazy, but mostly because it works. The recipe could easily be modified by using a different herb or different cheese. The problem with saucing cheese ravioli is that the sauce can’t be too complicated or flavorful or it will overpower the taste of the ravioli. So I figured that the simpler a sauce the better and figured tomatoes with a few aromatics and some herbs would be good. Plus we had fresh thyme in the fridge. While homemade pasta seems like a luxury and very time consuming, it really isn’t in this recipe. It took about 45 minutes or so from walking into the kitchen to finishing dinner. The pasta gets made while the sauce cooks so there’s no real downtime. I previously wrote more in depth instructions for pasta making and didn’t feel the need to repeat them here. When making my pasta, the dough ended up a bit dry so I added a few drops of water and that took care of the problem. The ravioli were good but Angela wasn’t as big a fan of the tomato sauce as I was. So I get to eat the leftovers for lunch today. Cut the tomatoes in half horizontally. 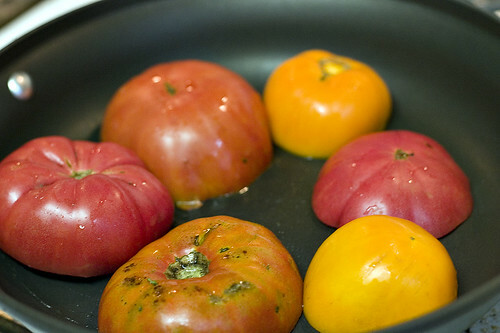 Place them in a large skillet, cover, and cook over medium heat for 10 minutes. Remove the tomatoes from the skillet and run them through a food mill with the disk with the largest holes (or peel the tomatoes and dice them). Clean the skillet and melt the butter over medium-high heat. When the butter is hot, add the onions and a pinch of salt. Cook until the onions are lightly browned. Add the garlic and cook one minute more. Add the tomatoes and season with salt. Lightly simmer for 25 to 30 minutes. In a bowl, mix together the ricotta, parmesan, parsley, and one egg. Season with salt and pepper and mix well. Using the well method, mix the flour and two eggs together. Knead the dough until it comes together. 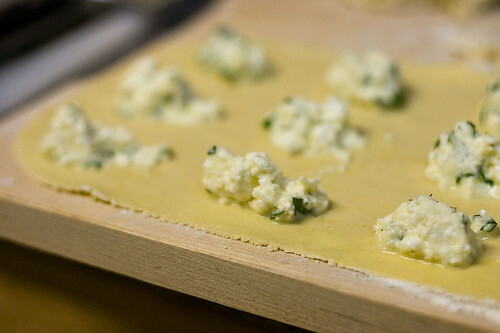 Divide the pasta dough into four pieces. Roll out one piece of pasta dough to the thinest setting. Place 1 tsp of ricotta mixture about 1 inch from the corner of the dough. Repeat with the remaining mixture until no room is left on the dough. Each drop should be approximately 1 inch from any other. See the picture above for an illustration. Spread the egg wash in lines between the filling mixture. Roll out another piece of dough to the thinest setting and place over top of the first piece of dough. Press down between the filling and try to remove any air bubbles. Cut the ravioli with a pastry cutter or pizza cutter. Make sure all edges are sealed on the ravioli. Repeat with the remaining pasta dough and ricotta mixture. 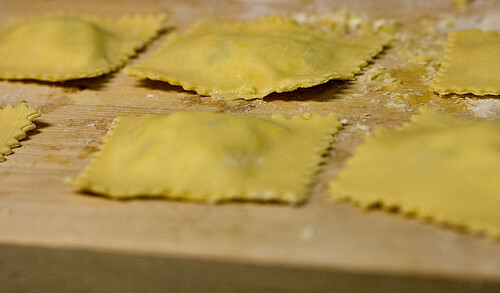 Cook the ravioli in salted boiling water for approximately 2 minutes after they begin to float. Add the thyme leaves to the sauce. Remove the ravioli from the water and add them to the sauce. Stir and cook for 1 minute more. 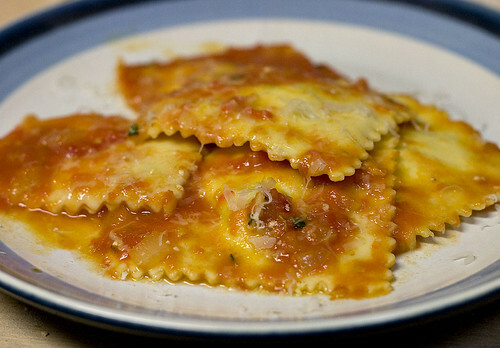 Serve the ravioli with the sauce and sprinkled with grated parmesan. These raviolis are perfect! So delicious, I love the filling you used. When I originally left a comment I clicked the Notify me whenever new comments are added checkbox and currently each and every time a comment is added I get 4 emails with the exact same comment.